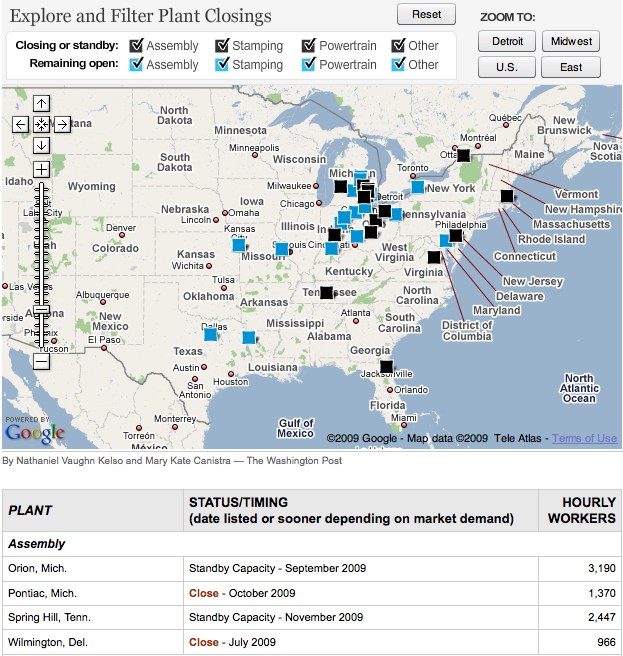 Under GM’s restructuring plan, the automakers’s manufacturing facilities will be reduced to 33 by 2012. Three distribution centers will also be eliminated. Click on map icons for plant name, location, number of employees and more. Screenshot below. Interact with original version at The Washington Post . . . This entry was posted on Wednesday, June 3rd, 2009 at 7:02 am	and is filed under Uncategorized. You can follow any responses to this entry through the RSS 2.0 feed. Both comments and pings are currently closed.